Discovery Cove Specials on Valentine’s Day! Couples will be dressing up and going out on Feb 14th for Valentine’s Day! Well Discovery Cove here in Orlando, FL wants you to take it off and jump head first into the fun!!! The tropical paradise of Discovery Cove awaits guests hoping to surprise their loved ones this Valentine’s Day. From intimate animal encounters and all-inclusive amenities, to VIP packages with private cabanas and marriage proposal options, there’s something for everyone looking to pull out the stops this holiday. Recently named the No. 1 amusement park in the world in the 2014 TripAdvisor Travelers’ Choice™ Awards for the second consecutive year, Discovery Cove makes the ideal place to be awe-inspired with a loved one. Discovery Cove is an all-inclusive day resort experience where couples can enjoy a one-of-a-kind opportunity to swim with dolphins, rays and tropical fish and hand-feed exotic birds. Discovery Cove is a paradise of rocky lagoons surrounded by lush landscaping, tropical reefs, winding rivers, a resort-style pool complete with waterfalls, and pristine white-sand beaches. Nothing warms the heart like an up-close encounter with an Atlantic bottlenose dolphin. Animal lovers will be wowed when welcomed by a kiss from their favorite flippered friend. Florida residents can now gift a day of discovery starting at $219+ tax for the dolphin swim experience, and starting at $149+ tax for the day resort package. Planning to pop the question this Valentine’s Day? 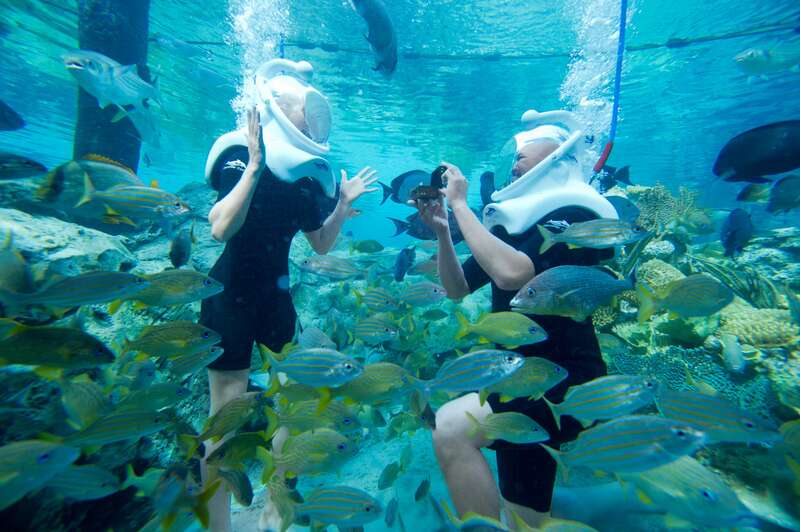 Discovery Cove is a one-of-a-kind marriage proposal venue, and offers two unforgettable experiences. Playful bottlenose dolphins can be part of a creative marriage proposal, and deliver a personalized “Will you marry me?” buoy. Another option is SeaVenture, which immerses the couple underwater to explore the sea floor of The Grand Reef®, where guests can propose among thousands of tropical fish and rays. Visitors seeking to impress their sweetie with VIP treatment can reserve a Valentine’s Day package, which includes a private cabana with a personal host, planned itinerary, champagne, roses, snack, beverage and towel service, an additional animal encounter and much more. The Valentine’s Day VIP package is $799+ tax and is only available Valentine’s Day weekend, Feb. 14 and 15. Additional special occasion packages start at $159+ tax. All packages require a dolphin swim reservation. 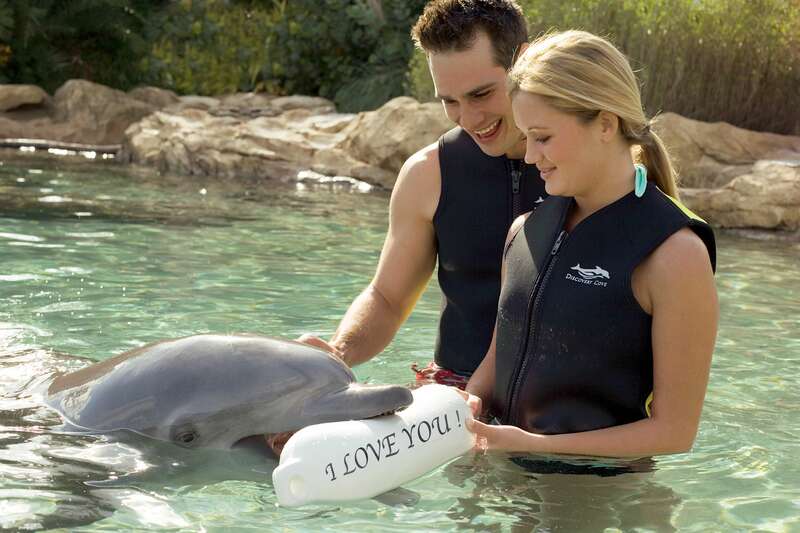 For more information, visit Discovery Cove special occasion packages. Couples looking for weekend getaway can enjoy Discovery Cove’s sister parks. Admission to Discovery Cove includes unlimited admission for 14 consecutive days to SeaWorld and Aquatica, SeaWorld’s Waterpark before, during or after Discovery Cove visit. At SeaWorld® Orlando, discover the thrills and chills of Antarctica: Empire of the Penguin and find out what it’s like to fly like a ray on Manta while also enjoying world-class shows and up-close animal experiences. At Aquatica, adventurers can brave Ihu’s Breakaway Falls, a watery free-fall on Orlando’s tallest, steepest and only multi-drop tower slide of its kind. After a watery-filled day at Discovery Cove, couples can savor the luxurious amenities of partner hotels like the Renaissance Orlando at SeaWorld®, where Valentine’s Day packages are also available, including dinner reservations and spa treatments.Visit RenaissanceSeaWorld.com for more details. For more information, or to make a reservation, visitDiscoveryCove.com or call 1-877-434-7268. Previous Post A Whole Lotta Hoopla Giveaway!!! Next Post Menu For Busch Gardens Food and Wine Festival Released!! !